The Blue Ridge Parkway is considered one of the country’s most scenic drives. With beautiful flowers and majestic lookouts that take your breath away, visitors take the parkway as it winds in and out of the mountains. The natural wonder of the region can be seen up close and personal as you hike trails along the parkway. 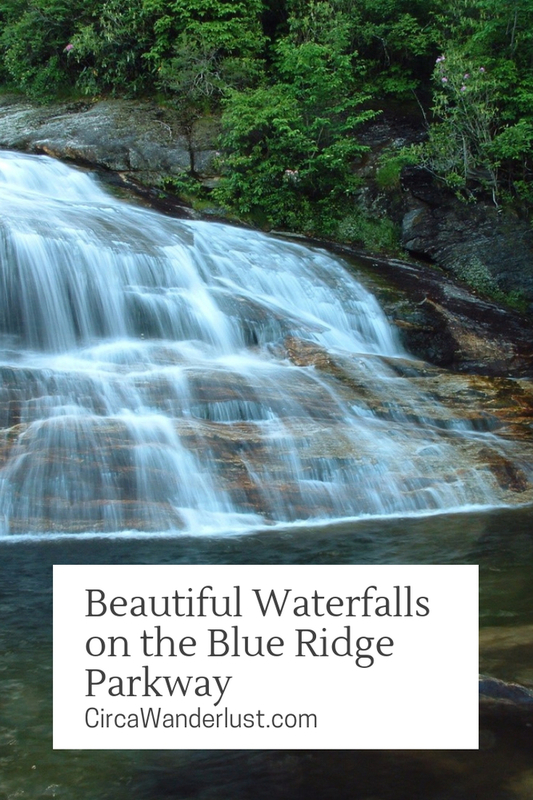 From waterfalls to blooming rhotedendrums that paint the landscape, here are seven hikes with waterfalls on the Blue Ridge Parkway! Before you head out on your hike, make sure you check out our themed playlist for the perfect soundtrack to nature. 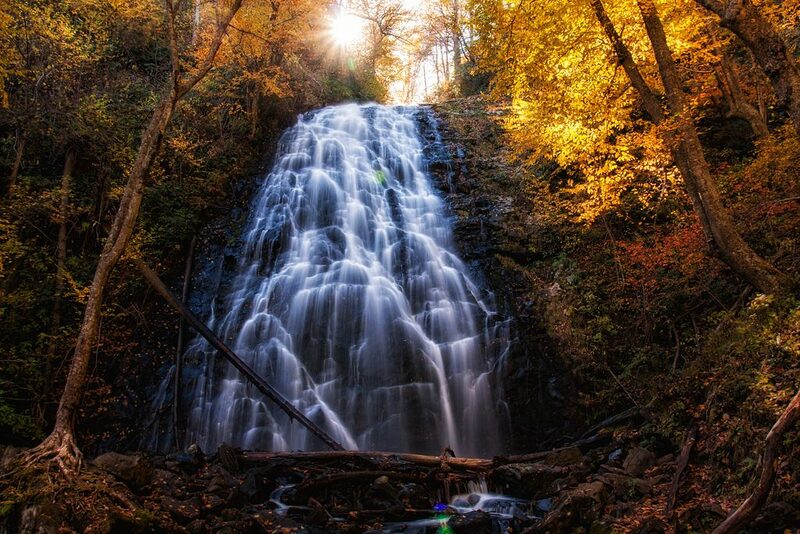 Apple Orchard Falls is one of Virginias most striking waterfalls on the Blue Ridge Parkway. The trail itself is an excellent hiking trail for everyone in the family through some stretches can be difficult. As you walk to the waterfall, you’ll notice that the trees look like an apple orchard which is how the mountain got its name. You will also see the great display of flora that calls the Blue Ridge Parkway home. Depending on the time of year you visit you’ll see rhododendrons, mountain fetterbush, trillium, bleeding heart, and many other plants. Apple Orchard Falls Trail begins at Sunset Field Overlook near milepost 78. The trail crosses into the Jefferson National Forest and also crosses the Appalachian Trail. The Fallingwater Cascades Trail is a moderately difficult loop that includes views of the nearby Flat Top and Sharp Top Mountains. Along the trail, there are also a number of places from which you will get to see Fallingwater Creek and Fallingwater Cascades. The 100-foot waterfall makes its way winding way down a large rock outcropping. The trail is a segment of the larger Fallingwater – Flat Top National Recreation Trail. Make sure you hike the whole loop too! You’ll see the falls about a half mile in, but to really see the falls at their peak keep going until the end of the trail. The Linville River was known as the “river of many cliffs” to the Cherokee. And the Linville Gorge, known as the “Grand Canyon of the Southern Appalachians” was the first officially designated wilderness area in the nation. Filled with native wildflowers the area is beautiful as pops of color speak out from the towering hemlocks. 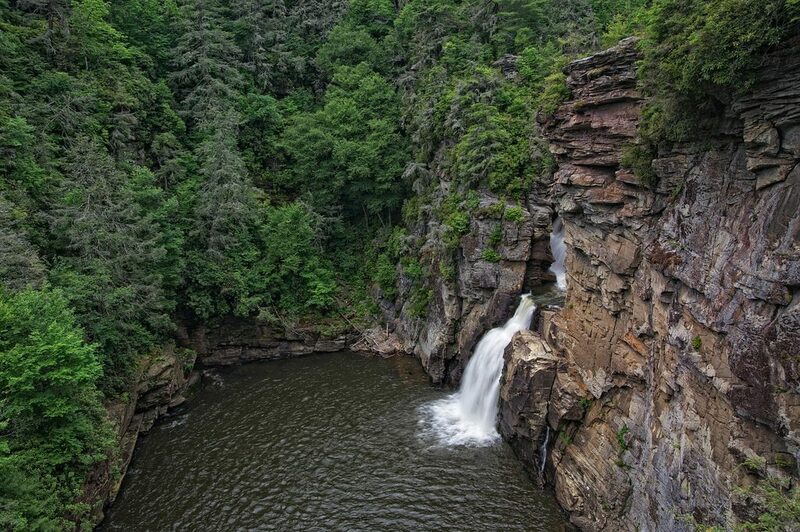 Linville Falls is one of the most popular waterfalls on the Blue Ridge Parkway and along the Blue Ridge Mountains. Two main trails will take you to the falls. The first is known as the Erwins View Trail (1.8 miles RT) where you can truly see the power of the water that carved the gorge from a number of overlooks and a relatively easy hike. At the second overlook, Chimney View, you will get a great view of both the upper and lower falls. 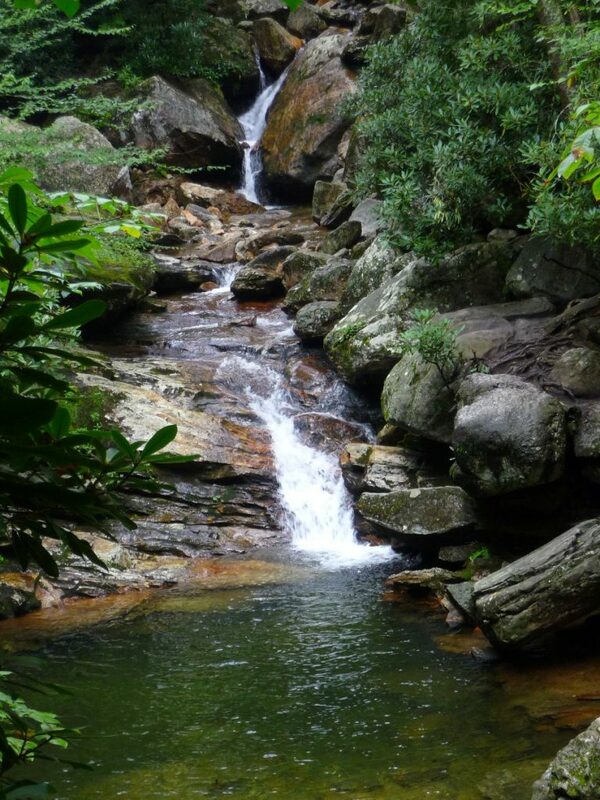 The second, known as Linville Gorge Trail (1 mile RT), offers views of the falls lower section as it plunges into a basin before flowing into the Linville River itself and is considered more strenuous. 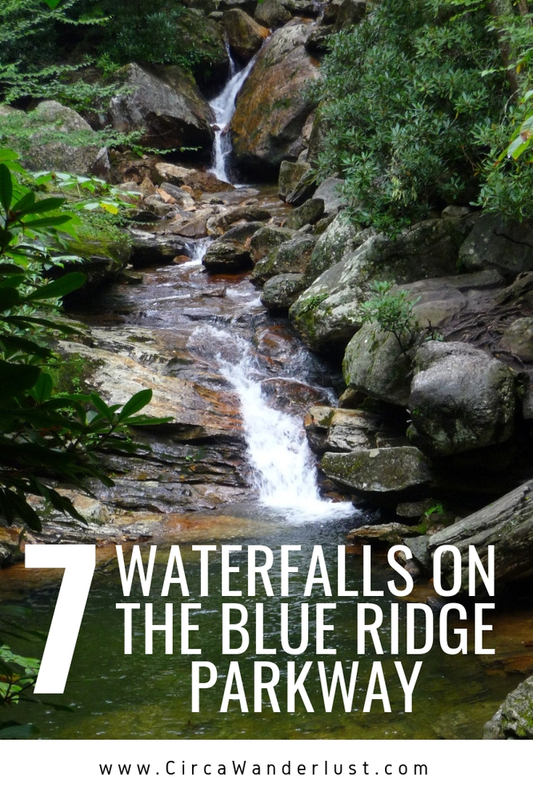 Just six miles off the Blue Ridge Parkway is the highest vertical-drop cascading waterfall east of the Mississippi. 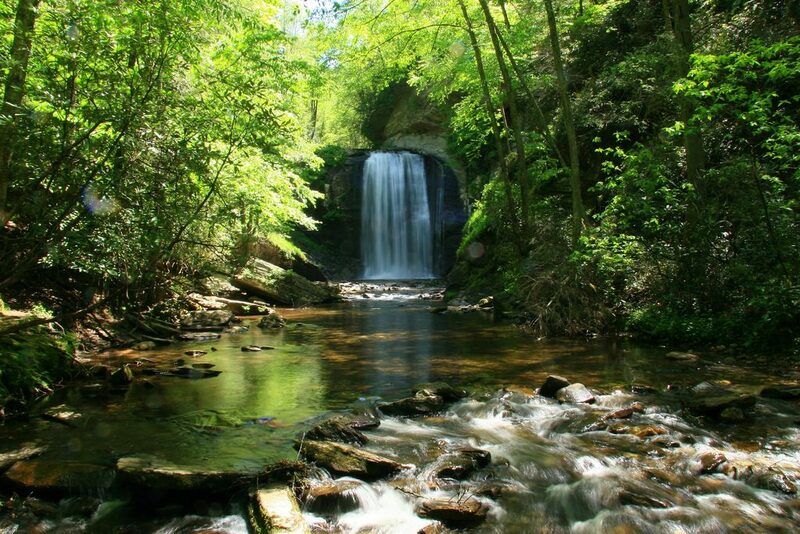 Crabtree Falls is a sight to be seen! With 5 major cascades (as well as some smaller ones) that fall a total of 1,200 feet. The first overlook is about a hundred feet from the parking lot with a gentle paved trail that leads to it. So many other waterfall hikes require a few miles of trail before the scenic waterfall, so the close lookout makes it a great option for any age or ability wanting to a waterfall. The falls can be accessed via a woodland hiking trail with two options: an easy 3-mile hike to and from on the same trail or a bit more strenuous 3.5-mile loop trail that climbs a ridge above the falls. No matter which one you choose, you are sure to have a beautiful hike! In the summer there will be plenty of wildflowers to decorate the trail and in the fall the changing colors of the leaves will be a gorgeous backdrop that accent the waterfall. 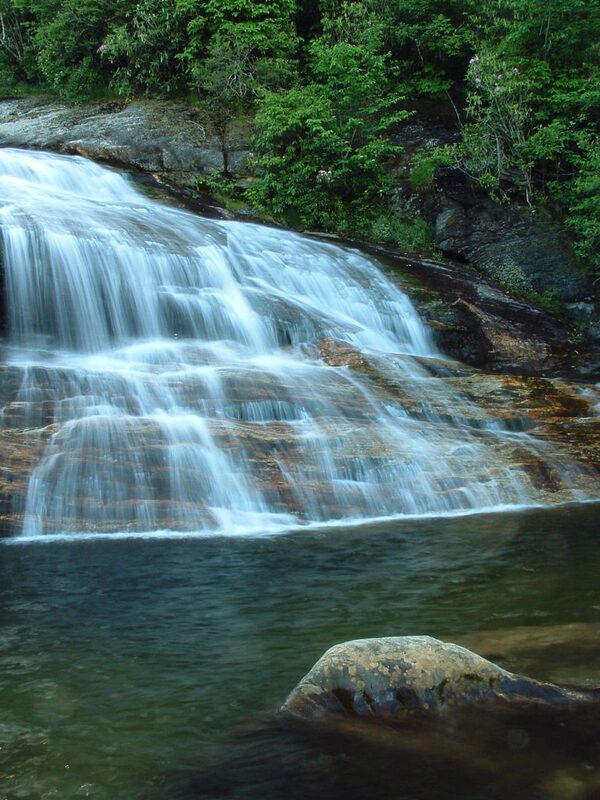 Looking Glass Falls is another popular waterfall in North Carolina and possibly one of the easiest to view as there are few “roadside waterfalls.” The waterfall is 60 feet tall and steps lead down for a close-up view or a swim underneath the falling water when the flow isn’t strong. On a hot summer day, the clear cold water of Skinny Dip Falls is where you want to be! This swimming hole and beautiful waterfall setting are practically next door neighbors to Looking Glass Falls and Graveyard Falls. The falls can be enjoyed year-round and feature multiple cascades and pools making it the perfect picnic location. Families fear not, clothing is not optional as the name suggests! Though it does make you wonder how it got its name…. Graveyard Fields is a really unique area along the Blue Ridge Parkway. The area and the falls got its name years ago when tree stumps from trees that had been toppled over by a strong wind several hundred years ago looked like gravestones in a graveyard. The forest has been slowly recovering the wind as well as a 1925 fire that burned the recently logged area. A short hike will take you to the lower falls but if you choose to go the extra 3.5-mile loop to the upper falls, you won’t regret it as you make your way through a beautiful meadow! The area is popular as a swimming hole on hot summer days, so if it is sunny out consider stopping to cool down a bit. Most people who have driven along America’s most scenic highway will tell you that you don’t need to get out of the car to take in its beauty. 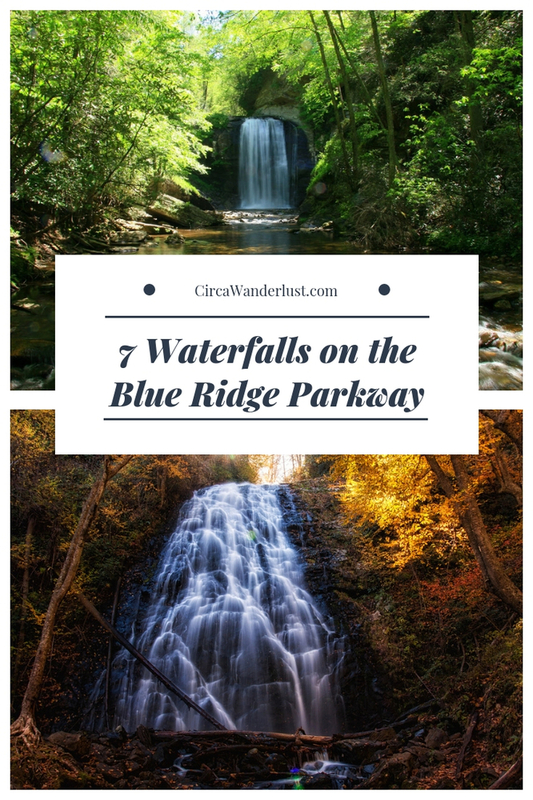 But if you do choose to chase waterfalls on the Blue Ridge Parkway, you’re road trip will be one you never forget!